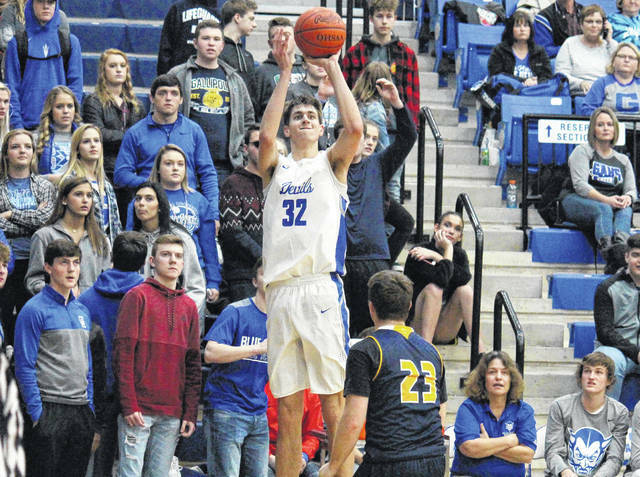 Gallia Academy sophomore (32) fires a three-pointer during the Blue Devils’ win over South Point on Feb. 2 in Centenary, Ohio. COLUMBUS, Ohio — The Ohio Prep Sportswriters Association has released the Division II All-Ohio boys basketball teams, featuring Gallia Academy sophomore Zach Loveday. Loveday — a 7-foot center — was named to the special mention portion of the All-Ohio list, after being named honorable mention last season. In his sophomore campaign, Loveday averaged team-highs of 17.3 points, 11.5 rebounds and 4.3 blocked shots per game for the 20-4 Blue Devils. Loveday also averaged 1.3 assists per game, while shooting 61 percent from the floor, 36 percent from beyond the arc, and 64 percent from the free throw line. The Division II Player of the Year award went to Revere senior and Northwestern commit Pete Nance. The Division II Coach of the Year award went to Wauseon’s Chad Burt. Cameron Brooks-Harris, Zanesville, 6-7, sr., 20.5 ppg; Trey Singleton, Byesville Meadowbrook, 5-10, sr., 24.7; Jelani Simmons, Columbus Beechcroft, 6-6, sr., 20.0; Jerry Higgins, Cleveland Villa Angela-St. Joseph, 5-9, sr., 22.8; Dwayne Cohill, Parma Heights Holy Name, 6-2, sr., 21.9; Pete Nance, Richfield Revere, 6-10, sr., 21.0; Austin Rotroff, Wauseon, 6-9, sr., 14.6; Kollin Van Horn, Proctorville Fairland, 6-8, sr., 16.0; Terry Durham, Cincinnati Woodward, 6-5, 24.0; Myles Belyeu, Trotwood-Madison, 6-4, sr., 25.2. Justin Heacock, New Concord John Glenn, 5-11, sr., 15.7; Taevion Kinsey, Columbus Eastmoor Academy, 6-5, sr., 19.5; Luka Eller, Mentor Lake Catholic, 6-5, soph., 20.2; R.J. Sunahara, Bay Village Bay, 6-6, sr., 22.8; Mason Lydic, Peninsula Woodridge, 6-1, sr., 22.5; Scott Walter, Akron St. Vincent-St. Mary, 5-10, sr., 12.0; Keith Williams, Sandusky, 6-1, sr., 18.8; Cade Stover, Lexington, 6-5, jr., 18.0; Luke Thomas, Proctorville Fairland, 6-2, Sr., 14.0; Joey Edmonds, Cin. Wyoming, 6-0, jr., 21.2. Connor McGuire, Gnadenhutten Indian Valley, 6-0, sr., 13.2; Garrett Tipton, Columbus Hartley, 6-5, sr., 16.5; Alex Sulka, Chardon, sr., 6-3, 27.8; Aaron Loines, Cleveland Glenville, 6-4, sr., 17.0; Matthew Francesconi, Tallmadge, 6-3, sr., 20.6; Daniel Unruh, Elida, 6-2, sr., 17.1; Logan Swackhammer, Chillicothe Unioto, 6-2, sr., 18.2; Colin Woodside, Lancaster Fairfield Union, 6-6, sr., 15.6; Amari Davis, Trotwood-Madison, 6-4, jr., 21.2; Jabali Leonard, Dayton Meadowdale, 6-0, sr., 23.0. Connor Wright, Minerva; Caden Arbaugh, Cadiz Harrison Central; Nate Voll, New Philadelphia; Justin Shipman-Curtis, Columbus East; Datrey Long, Columbus Beechcroft; Shannon Stanley, Bexley; Kayin Derden, Columbus DeSales; Hayden Kanicki, Ashtabula Edgewood; Braeden O’Shaughnessy, Poland; Brandon Wahl, Louisville; Connor Tamarkin, Warren Howland; Brandon Haraway, Norwalk; Chance Barnett, Belleville Clear Fork; Ethan Heller, Thornville Sheridan; Giovanni Santiago, Cin. Hughes; Landen Angel, Hamilton Ross; Isaac Beam, Chillicothe Zane Trace; Zach Loveday, Gallipolis Gallia Academy; Naylan Yates, McArthur Vinton County; Clayton Howell, Waverly; Josh Huffman, Vincent Warren. Scott Wormald, Canal Fulton Northwest; Cyler Kane-Johnson, Niles McKinley; Michael Huberty, Alliance Marlington; TJ DeShields, Beloit West Branch; Mitch Davidson, Salem; Braden Tucker, Streetsboro; Jonathan King, Akron Buchtel.